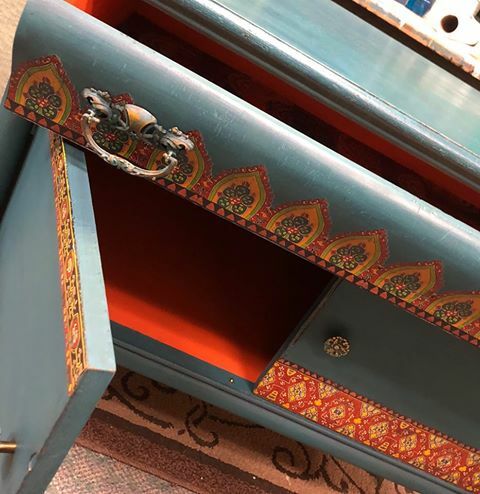 Original painted antique/vintage furniture and artisan market. 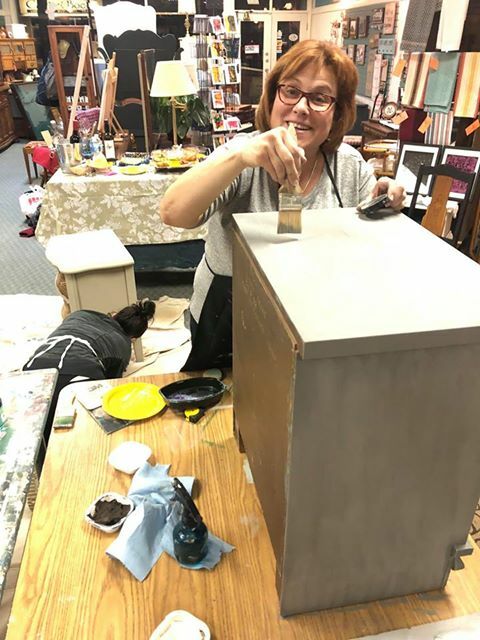 Marmie’s Empty Nest offers custom furniture painting, paint parties and workshops, a gallery of local artisans, and chalk style furniture paints. Nestled in the heart of downtown Camrose on Mainstreet. Here at Marmie’s Empty Nest we provide a wide selection of high-quality, chalk-style paints ranging over four distinctly Canadian paint lines. The FAT Paint company was founded in 2012 by a dynamic sibling duo in New Westminster, British Columbia. It is an artisan chalk-style paint perfect for all your furniture painting needs and more! With a beautiful palett of 56 on trend colors, you are sure to find your perfect color. We also have glazes, wax (which is as creamy as your night cream), Clear Top Coat to seal your projets beautifully. If you are not near a retailer just the button below and you can order online, directly through their online store! It’s a powdered, paint that has been around for thousands of years. It was found in the pyramids in Egypt and on ancient cave paintings. It’s been used in America for years on furniture, walls, barns, etc. It is a versatile paint that can be used to achieve a variety of looks from chippy and distressed to smooth and sleek. Established in 1989, Homestead House Paint Co. began its life as a reproduction furniture manufacturer that found a need to create its own authentic milk paints to replicate beautiful old world finishes. Recognizing a need in the market for these specialty products, we quickly expanded our paint line to offer a variety of other coatings and finishes. These include our 100% Acrylic Exterior & Traditional Oil paints, and our newest product line Fusion™! Country Chic Paint was founded in January of 2014 by the husband-wife team Jan & Rosanne Korteland in a small town on Vancouver Island, British Columbia. If you do not have a retailer near you, click the button below, you can order Country Chic paints directly from their website! (We will recieve a small commission - at no extra cost to you). Bring your friends, and some old furniture - and we’ll liven them up together! Choose your font, saying, or design - we supply the stencils, paint, and workspace! 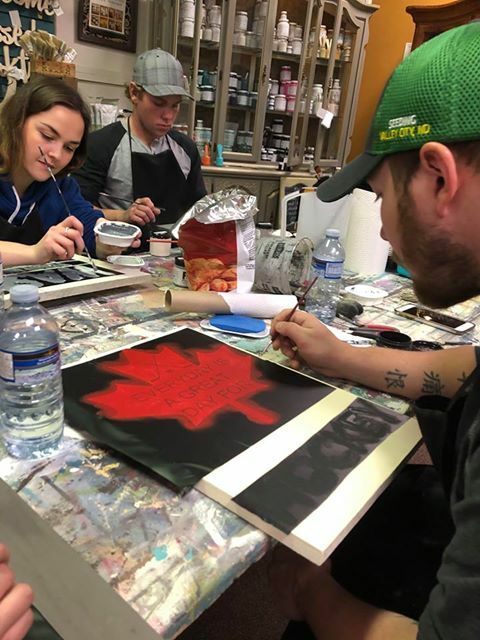 We supply the stencils, paint, brushes, and workspace - you bring your designs and the people! Looking to upgrade the techniques in your arsenal? We offer one on one training! Bring in your pieces in need of some love, and we’ll take care of it for you! You get busy - we understand! That’s why Marmie’s Empty Nest offers custom furniture painting. Bring in your piece or furniture set that needs some work - or we can arrange to pick it up - and we will paint it for you! We have a Silhouette Cameo vinyl cutter ‘printer’ and can cut stencils for your project! Bring in a design, or a general idea - and we will design, edit, and cut you a stencil for any project!